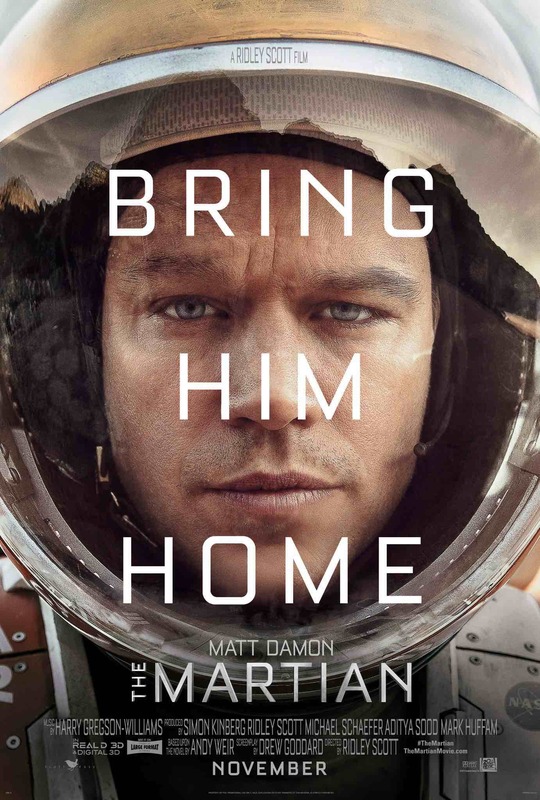 Mark Watney (Matt Damon from “Interstellar”) is part of a Mars mission with his five other astronaut buddies when a storm blows across the big red planet. He thinks they should wait it out, but Commander Lewis (Jessica Chastain from ”Interstellar “) doesn’t want to take the chance and decides to blast off early. Mark was planning to go with them, really he was, but a big piece of debris hits him and blows him into the dust storm just before the ship is about to blow over. It was impossible to find him, and impossible to stay and impossible for him to live. Well, two out of three of those things were actually impossible. Mark lives and makes his way back to the science station. The first thing he decides is that he is not going to die. The next thing he has to do is see if he can stay alive until the next scheduled bus comes through in about four years. At that moment, a new super hero is created: “The Botanist.” That’s right, Mark has a certain set of skills that allow him to grow plants on a planet without life while I can’t grow a tomato plant in my back yard. While the crew mourns his loss and NASA holds his memorial, a blonde-haired girl named Mindy (Mackenzie Davis from “That Awkward Moment”) notices something odd on the satellite photos. The Rover keeps moving around from day to day, and that can only mean one thing: somebody left the keys in it, and Watney is cruising the planet looking for those Amazon women he heard about. Much like “Gravity,” we have a single person, lost in space, seeking only to survive. While me and everybody else on the Earth rooted for him to survive, we learn about the human spirit, and what one man can do with a blonde girl looking out for him. I have my own blonde who’s looked out for me since 1981, so I’ve got that going for me, which is nice. Director Ridley Scott (“Prometheus”) strikes a good tone of hope and positive thinking that is almost akin to a Disney movie, like when Mark is about to run out of food and they call the Chinese for takeout. The only dark moment that I identified with was when Mark ran out of catsup. Based on the Andrew Weir novel, this is not an epic motion picture or a riveting as “Gravity,” but it I really liked it. This this is a good story, well told, that kept me engaged and wanting to see if he was going to make it home. For that, I must give this movie 4 stars out of 5. Believe in the impossible and you just might find a blonde to look after you.